With close to 30 years' experience in the shopping center industry, PSC has provided well trained security officers to malls across the country. Shopping centers are an intricate and complex "community" of tenants, patrons, managers, and contractors. PSC understands that no two shopping centers are alike and therefore customizes its operations to the needs of the client. PSC further understands the importance of client communication on a daily basis to maintain its proactive stance to serve the client. PSC is an active partner with the International Council of Shopping Centers (ICSC) and serves on its security planning committee. PSC has provided well trained security officers to malls across the country. Shopping centers are an intricate and complex "community" of tenants, patrons, managers, and contractors. PSC understands that no two shopping centers are alike and therefore customizes its operations to the needs of the client. PSC further understands the importance of client communication on a daily basis to maintain its proactive stance to serve the client. PSC is an active partner with the International Council of Shopping Centers (ICSC) and serves on its security planning committee. In our 26 years of experience, PSC has evolved and adapted to the ever-changing world demands, persevering through its challenges and achievements in the security industry. Our strengths lie within the quality and selection of our management team, training of our line officers, and the use of the most advanced methods and proprietary technology to assist and monitor the consistency and quality of our service. PSC has developed a comprehensive yet simple training program. We are certified as a trainer by numerous associations including the Homeland Security and the American Heart Association. We believe that there must be a certified trainer in every account to ensure that every security guard is trained on a timely manner. By utilizing our computerized program we create a color coded and simple tracking system that enable our clients to monitor the training process with full transparency. PSC is a world-class provider of security guard services, patrol, investigations, backgrounds, consulting, security screening & specialty services, site vulnerability audits, executive protection and web-based incident management (tracking, reporting & notification) software. PSC Management and advisory group is comprised of senior officials formerly with the Israeli Secret Service, various Police Departments, US Military and Marines, FBI, US Secret Service, US Marshall Services, Drug Enforcement Agency, Homeland Security and other Intelligence Services throughout the World. Almost all our senior management team has earned a university degree and in some cases a master’s degree in criminal justice, law, finance, business administration and computer science. Our group brings years of experience in counterterrorism, intelligence gathering, crime investigation and prevention, event planning and computer forensic examination. In addition, all of our Management receives advanced training which includes emergency response, counterterrorism, crisis intervention, emergency preparedness, tactical communication, advanced drivers training, CPR/First Aid, AED and customer service. 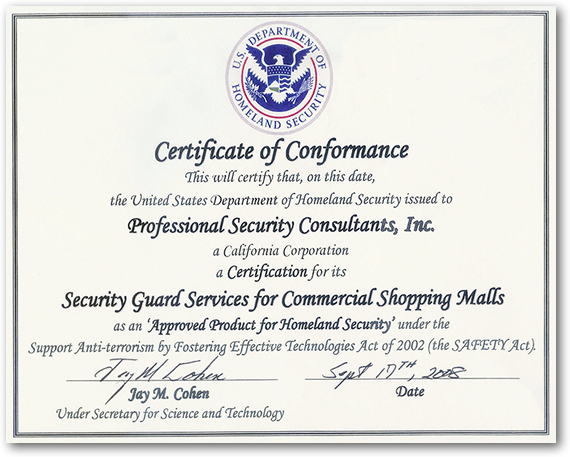 September 17, 2008 – Professional Security Consultants (PSC) provides the PSC Security Guard Services for Commercial Shopping Malls. PSC provides unarmed security personnel and security program management for the purpose of providing enhanced protection, deterrence, and response to terrorist acts against shopping centers. The services include: the provision and duties of the unarmed security officers, security dispatchers, security supervisors, and security directors, training, emergency response, and operation of the CASE Global system and Centralized Command Center. The Technology also includes procedures for recruiting, screening, and hiring of employees. This Designation and Certification will expire on October 31, 2013.